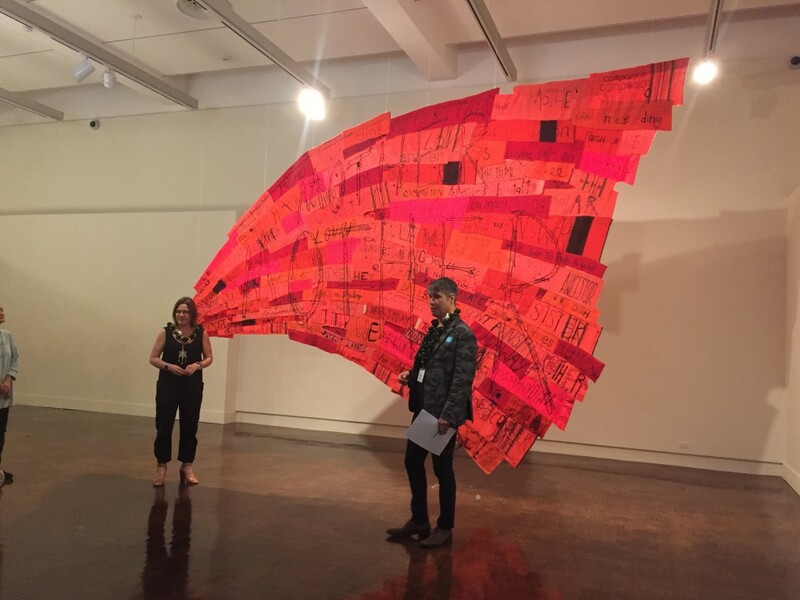 Hanging from the ceiling in the Clare Boothe Luce Gallery of Modern and Contemporary Art, Portland-based artist Marie Watt’s massive, red work for the Honolulu Biennial shouts at you. Aptly titled Companion Species (Speech Bubble), the pennant-shaped piece has “Mother Mother” emblazoned across the front (or Side A, as Watt calls it). The assemblage of more than 100 blanket fragments is stitched with text, such as “sister sister” and “brutality.” Take a closer look and you’ll notice the needlework is different on each fragment, as unique as a fingerprint. In a way, various fingerprints did leave their own imprint on the artwork. 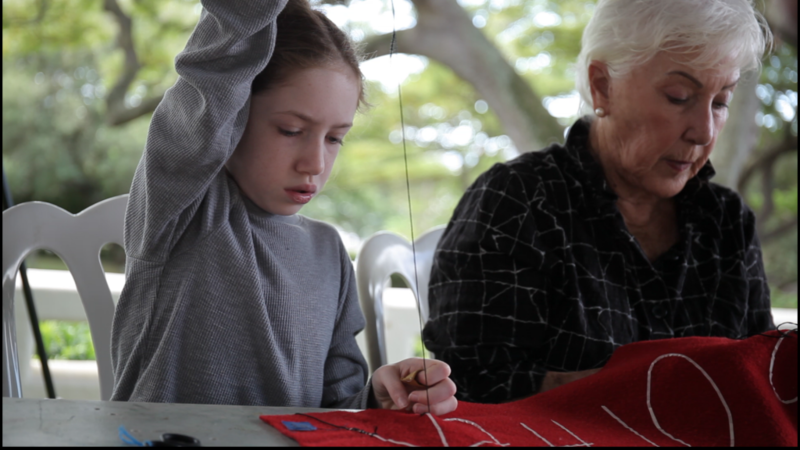 On January 20 at Family Sunday Presented by Bank of Hawaii Foundation, Watt hosted a sewing circle on the Spalding House lawn. 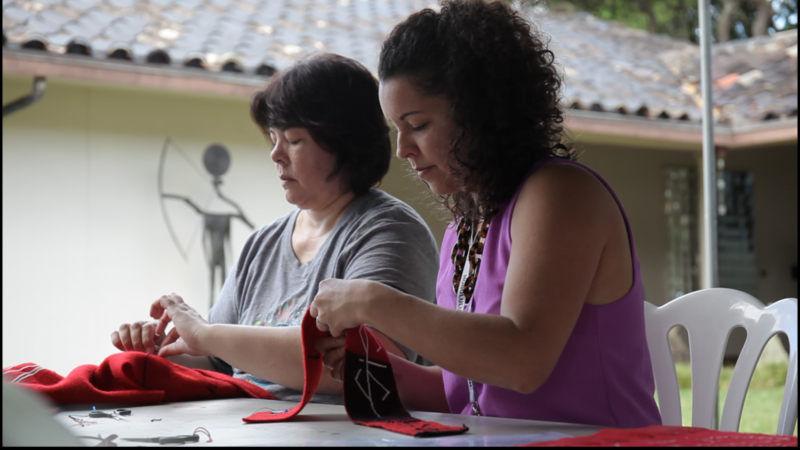 People from all walks of life gathered to hand-stitch on red blanket fragments that would be joined together to create the final work of art. Watt couldn’t have done a better job at setting the stage for the sewing circle. 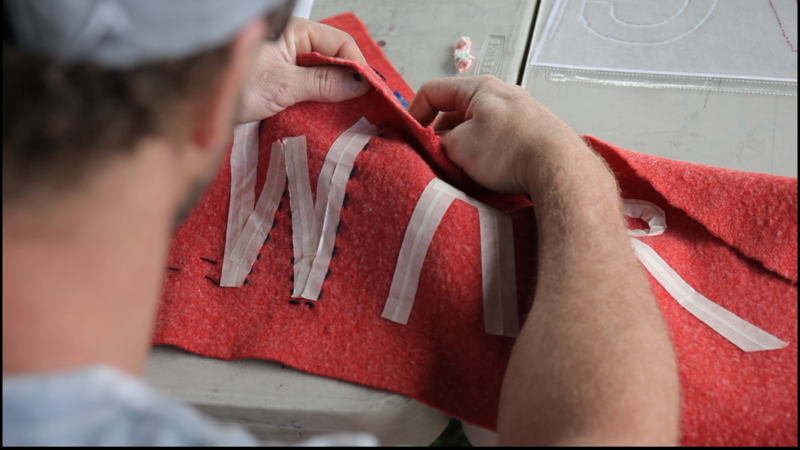 She and her assistant Brianna threaded the needles, taped words onto the cloth fragments, and sometimes even started the stitch off, so all anyone had to do was take a seat and start sewing—adding their own personal flair to it, of course. “This open-ended style welcomed the novice as well as those who were skilled,” says Sara Oka, HoMA’s curator of textiles and one of the sewing circle participants. 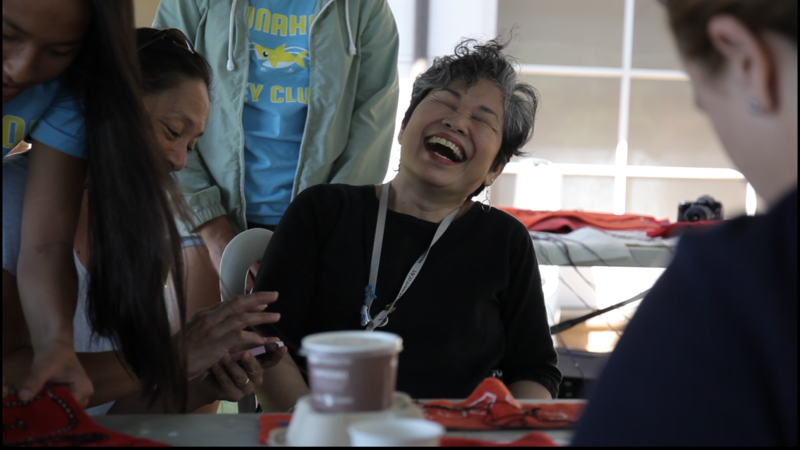 The openness of the sewing circle also invites a sense of unpredictability—someone can stay for five minutes or an hour. On that day, the diverse group included docents, teaching artists, high school students and some younger children (who were accompanied by an adult), according to associate director of public programming Sheryl Kramer. “And while the table was quite full, there was always space for someone new to join in,” she added. 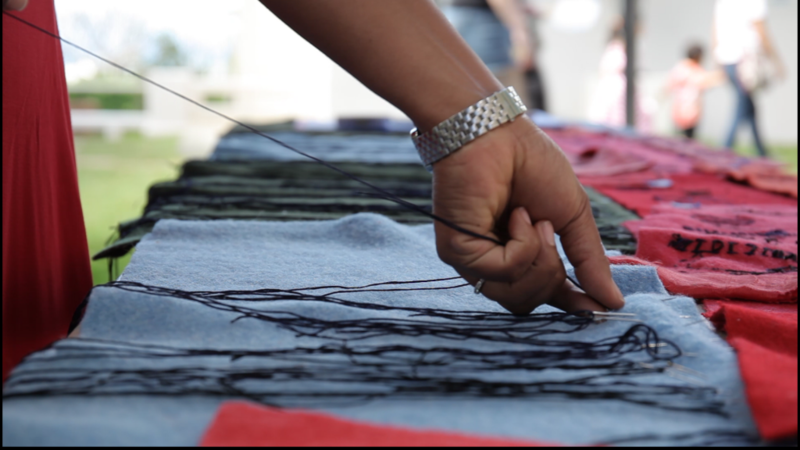 As the stitching ensued, participants found themselves connecting with each other in an unexpected way. “Maybe I’m biased because I’m the one hosting it, but one of the reasons why I’ve continued to do sewing circles for over a decade now is I think when your hands are busy at work and your eyes are diverted at working on a piece, stories just seem to flow,” Watt said while at the museum to oversee the installation of her work. According to Watt, these sewing circles are events in themselves and not just a means of finishing an artwork. For Companion Species (Speech Bubble), she held additional sewing circles at Portland Community College, Crystal Bridges Museum in Arkansas and in her studio, where the pieces were assembled into the final artwork.